Part of our Shikoto Tanto collection, this battle ready piece has been crafted with painstaking attention to detail and performance. From the leather wrapped handle to the beautifully layered Damascus steel blade, this Samurai sidearm is as sharp and capable as it is stunning! Full tang and battle ready tanto knife. Highly sharpened hand honed blade. High carbon steel Damascus blade with lightly darkened finish. Traditional construction method with bamboo pegged tang. Hardwood handle with black dyed ray skin. Metal tsuba for added protection. Brass habaki and all metal fittings. 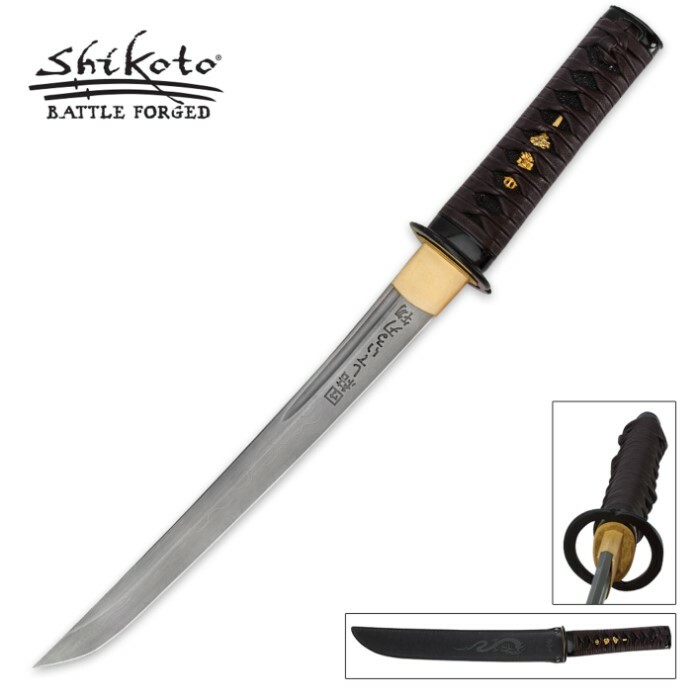 Kanji engraved blade which translates as "United Strong Steel"
Miyamoto Musashi's own famous tsuba (guard) design. Includes genuine leather sheath with Orient Dragon artwork. Measurements: 11 3/4 in. blade, 18 1/2 in. overall.